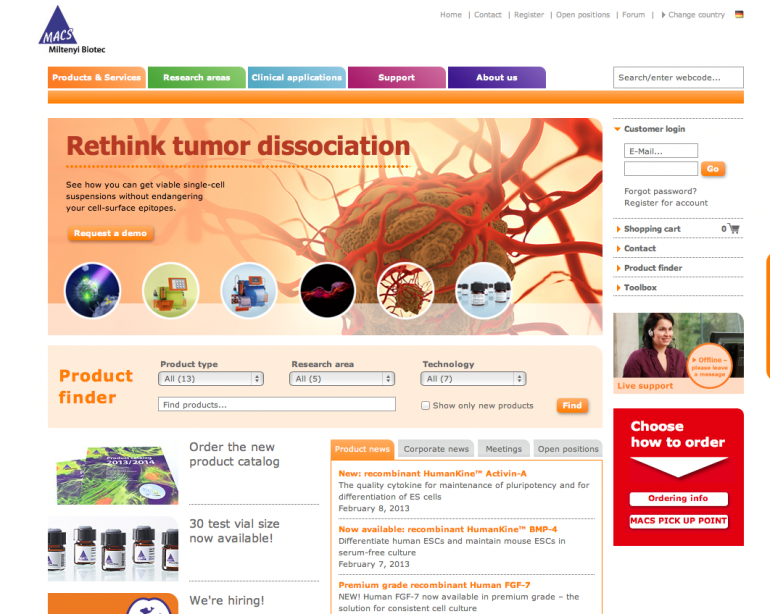 Relaunch of the website in January 2013. The website of Miltenyi Biotec needed an actualization and picture management process in the backend. For this, the picture sizes (aspect ratio, general format) were limited to 7–10 standard picture formats, and all pictures were processsed by cutting and preparing them for every single possible format. A solid database (Cumulus) is in use to handle all the pictures tagged by the website area to make it easier to find and change them. This process helps to actualize and select pictures for internal banners, teaser entries and thumbnails. The complete number of pictures, ready to use, extends the number 6K and is constantly growing. The picture preparation was simply a mass job, but by the use of PSD templates, it was to be handled in some weeks successfully.